Was the moving experience just a prelude of things to come? Well, it is and here I am ready to disclose it all or at least some of it. We returned from North Carolina a day late. My boss at my new job was not happy, to say the least. I ended up with only two shifts a week at my restaurant job…not enough to support the rent I signed up for. John couldn’t find a place to live and I couldn’t afford the apartment that I rented. We talked about how nice it would be to live together. We also talked about our parents reaction to the news and our Catholic upbringing. In the end, we decide that we wanted to live together, not only to be together but also for all of the practical purposes…but how would we break the news to our religious parents and our teenage boys? The only logical explanation was to hang the duck. Just let me note here that John Lennon has it right. Well, I can because I’ve been there and it was the most freeing experience of my life. When I first left an abusive 20 year marriage, all I had in the world was half a trash bag of clothes and two pairs of shoes. I was never a materialistic person, but that experience has changed me in a way that most people couldn’t even imagine. I’m smart, savvy, and completely disconnected from the material world. Sorry, Madonna, but I am not a material girl. Owning nothing for that short period of time in my life was actually an amazing life lesson that has shaped who I am today. One of the few possessions that John got to keep from his divorce was a ceramic duck that he loved. It had hung on the wall of his family’s home when he was a child. Somehow we decided to hang the duck, (over our front door entryway), invite our parents over for lunch and hope that they would notice, get the message, and surmise that John and I had decided to live together. It seemed like an obvious, great plan. Just for the record, it was a total bust. Our parents never noticed the duck and we never had the guts to tell them about our living arrangement during lunch. In retrospect, the entire scenario seems ridiculous, especially seeing that John and I were respectively 46, and 45 years old at the time and well beyond needing our parents approval. And yet, that wasn’t our biggest hurdle, by a landslide. In December 2012, my boys spent their Christmas vacation with their father. John and I spent that vacation in an immaculately clean house relaxing and enjoying each other’s company. When my boys returned, everything was different, but seemly okay. Well, except for my son Marc. We were surprisingly functioning as a household, then left for a business trip to Pennsylvania. Upon John’s return all hell broke loose. John came through the door exhausted from traveling and he was running a fever. “All I want to do is get into bed,” he stated. It was l:00 AM and I was concerned about John’s weak condition. I suspected that he had the flu. John made his way upstairs to find Marc lying diagonally across our queen size bed, with a death grip on the corner. Marc is a strong and willful kid. We tried everything that we could think of, but there was no compromising and no moving Marc. Finally around 4:20 AM, I said, “This is ridiculous. Let’s go to a hotel.” I grabbed a bag and started throwing some clothing in it. Leaving was a just ploy to get Marc out of our bed and a long shot, but it was worth a try. “Where are we going?” John asked. “No idea. Just drive around the corner.” I said. “So, you’ve abandon the kids?” My ex-husband asked. “I haven’t. We’re just having a problem.” I said with disdain. “The police and an ambulance are on the way,” my ex replied, then hung up. We were only up the street. “John, turn around,” I said. We headed back to the house. The police and the ambulance never came but Marc did finally relent and made his way to his own bedroom. This was just the beginning of the power struggle between Marc and John but not the end of our challenging circumstances. That summer, John decided to send a friend who was in a domestic violence situation some money so she could leave her husband who was in the military. She even came to stay with us for a short time until she got on her feet. Once she had found her own place and was in the midst of her divorce, we received a phone call. “May I ask who’s calling?” I inquired. The voice on the other end of the line rattled off his name, rank and informed me that he was an investigator with the military, the United States Government. He set up an appointment to drive out from Washington D.C. to get sworn statements from us for the investigation that was underway during our friend’s divorce proceeding. When Marc returned from school that day, he walked in the door and found John and I seated with the two investigators. “This is my son Marc.” I said. Each of the investigators shook Marc’s hand and explained that they were from the United States Government performing an investigation. Rocky had just gotten off the school bus. As he climbed the front porch stairs Marc flew open the door. “Rocky, the government is here for an investigation but they can’t tell us why.” he yelled. “Let’s call Kevin!” Marc piped in as he ran to the phone. The investigators spent hours asking us questions. “Kevin, I can’t tell you and it’s nothing that any of you did,” I stated. “Well, is it something that dad did? Is it?” Kevin pleaded. The investigators gave John and I each three sheets of paper and had us sit in separate rooms. We were instructed to write our sworn statements detailing anything that our friend had confided in us regarding her suffering any kind domestic abuse. John was done in half an hour and barely had one written page, in the same time I had filled three sheets of paper and asked for more. (What can I say? I’m a writer!) John was asked to go back upstairs and fill the three sheets of paper that he was given. I laughed to myself. When we were done writing and I thought that it was finally over, we sat while the investigators read and initialed every page and asked that we do the same. My phone rang again. It was my ex-husband. “Um Erin, please tell me that this has nothing to do with me.” He said. “Well, I hope that you’re telling me the truth.” He said, before hanging up the phone. “They didn’t Marc but you better behave just in case,” I said jokingly. Marc began picking up knickknacks and looking under tables. “Mom, what’s that flashing red light?” Marc asked in a panic, pointing towards the ceiling. “That’s the smoke detector Marc.” I said. It wasn’t long before Rocky joined in and began helping Marc search for cameras and other devices. “Okay, guys. That’s enough.” I demanded, but I did not calm their fears and the search continued. Luckily, I had the investigators business card…and I wasn’t afraid to use it. I picked up the phone and dialed the number. “Hi, it’s Erin. Sorry to bother you.” I said. “Marc, the investigator wants to talk to you.” I yelled. “Me? He wants to talk to me?” Marc asked looking bewildered. I handed Marc the phone. I’m not sure what he said to Marc but he seemed to put off the camera search…at least for a while. Eventually, things went back to normal, whatever that means in our house. The following spring, there was a rash of signs being stolen from Cumberland Farms Stores. 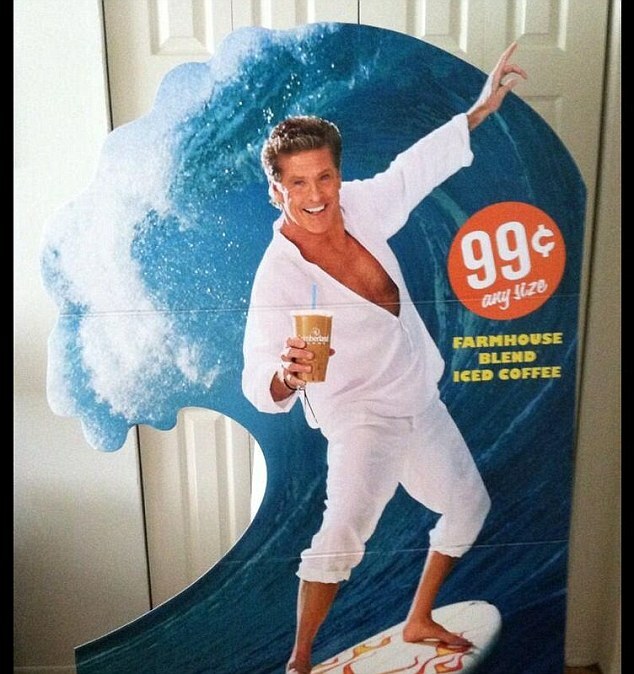 I guess it became a sort of dare among teenagers and college students to pull into a Cumberland Farms and try to steal the life-size cardboard David Hasselhoff signs in the parking lot. I’m not sure if the appeal was in scoring a sign on a dare, or in the fact that David Hasselhoff was sporting white linen capris that made the entire idea so inviting but it became a trend across the country. One night the Cumberland Farms down the street from our house became the source of such a prank. Unfortunately, the prank went a bit too far and the outcome was tragic. A teenager that was attempting to steal a David Hasselhoff sign was approached by the clerk from Cumberland Farms. The clerk tried to retrieve the sign and somehow his clothes got caught in the perpetrator’s car door. The clerk was dragged by the vehicle, resulting in severe injures and trauma to his head. I was so upset when I heard the news. We frequented Cumberland Farms and I knew this clerk. His wife was pregnant and she, as well as his mother, both worked at the same Cumberland Farms as he did. I knew that this meant that there were now three people in their family that were out of work with no income. The clerk was in a coma and his wife and mother were sitting vigil at his bedside. I fired up the computer and began to type. “What are you doing?” John asked. “Figuring out how to get on twitter.” I replied. “Twitter. What for?” John inquired. “I’m going to tweet David Hasselhoff.” I confidently replied. “Whatever you want to do, babe,” John said with a smirk. He had become accustomed to my harebrained ideas. “And say what?” John asked. I followed the steps and set up my first twitter account. I composed my thoughts, wrote what I wanted to say and sent my tweet to David Hassselhoff. John was supportive but I’m sure he was secretly questioning if I had lost my ever lovin’ mind. Just for the record, I hadn’t. I’m just passionate and not afraid to act on my feelings. Strange to some… normal to me. To my surprise David Hasselhoff responded to my tweet and we had a conversation on twitter. He thanked me for letting him know what happened and promised he would look into it. The next day the Connecticut Post newspaper reported the story and even mentioned my tweet and the David Hasselhoff response. John and I spent the morning doing some gardening and planting flowers before our lunch date with my parents. It was a warm day and I lifted my gloved hand in an attempt to brush a dangling lock of blonde hair away from my face as I smudged a streak of dirt across my cheek. “John, the garden looks beautiful.” I stated, as a NBC Connecticut newsvan parked in front of our house. “He’s probably here about my David Hasselhoff tweet,” I joked. The driver got out followed by a cameraman. “Excuse me. Are you Erin Cooper Reed?” The reporter asked. “I certainly am.” I replied. “It took me forever to find you. Is it okay if we interview you on camera?” The reporter asked. “Sure, can you give me a minute to get cleaned up? I’ve been gardening all morning.” I said. “Uh, we really need to do this now,” he said with a smile. I insisted that I needed to clean up so he said, “We’re going to get the camera set up out here. It will take about five minutes. Can you be back by then?” I dashed upstairs. On the way up the stairs and into the bathroom to wash my face, my cell phone rang. It was my dad. “Hi honey! Mom and I are on our way over to pick you and John up for lunch. Are you guys ready?” he asked. “About a half an hour.” I said. “Love you too dad.” I said, then hung up the phone. Now, you know that your life is truly crazy when your dad calls to pick you up for a lunch date and you tell him that NBC news is there and he isn’t at all surprised… I mean not in the least. My interview with NBC news went well and aired that night. As far as I know, David Hasselhoff never sent the family of the injured man any money like I had hoped. We haven’t heard from John’s friend lately but I hope that she is doing well. Marc still finds way to torture John on an almost daily basis but I know that someday when he’s older he will come to realize and appreciate all that John does for him. As for me, I continue to live with my heart on the outside of my body, speak my mind, challenge the perspective in any situation and find the humor that gets me by. And just for the record…there’s more, there’s always more…so much that I may decide to continue this series down the road. Omg that’s a heck of a lot going on! I loved you tweeting David Hasselhoff!! I’d be terrified to be on the news! What a crazy story!! Crazy but true. 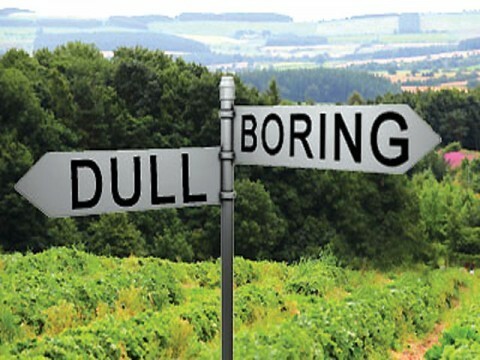 I just roll with all of it…at least I’m never bored! You and me both!! What a heck of a story though!